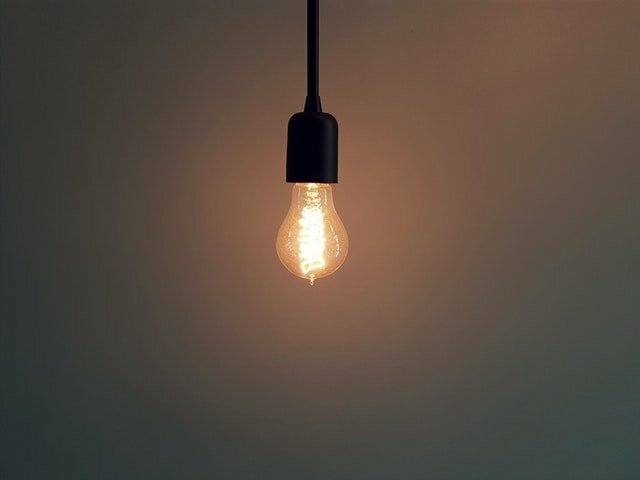 We often try to repair or improve electrical items in our homes, however this should be avoided since it may bring serious danger to yourself and others. A qualified electrician must be sought for every repair. When working around electricity, one of the main concerns is the possibility of being shocked or electrocuted. Any electrical shock can lead to injuries and even death especially when it is from higher voltages. Residential homes use around 110 volts for most of their appliances. However, there are certain appliances that require up to 240 volts, which is a deadly amount of current. Faulty wirings is a real concern for DIYers. Not only does it pose a risk of hurting one’s self through electrical shock, it can also cause a fire. Unlike electrical shocks that you feel immediately, electrical fire hazards can remain dormant for months. This leads to a false sense of security among DIYers. After several weeks, the wiring might short out if the copper deteriorates and splits, which can eventually cause a fire. This is another reason why you should always hire a trained electrician when you encounter any problem with your electrics. The law dictates that all electrical components installed in your homes are inspected before being used. This is often overlooked in DIY projects. Aside from being a risk, non-inspection can also lead to fines. When you hire professionals to do their job, you are sure that all electrical repairs are inspected. GFI or Ground Fault Interrupter is designed to prevent users from getting shocked especially if there is a faulty connection. This device is most commonly placed in areas that are always moist such as bathrooms and outdoor outlets. Although this is a vital part in electrical works, most DIYers are unfamiliar with it and end up neglecting this device. Only trained electricians are capable of identifying the areas in which GFI is required. These are just some of the reasons why you should not put electrical works into your own hands. 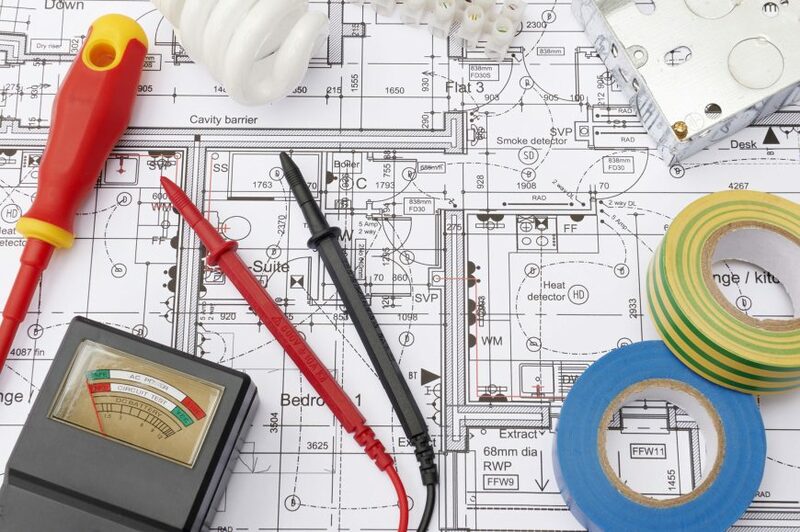 If you are planning to hire an electrician to do the job, EJS Electrical can help. 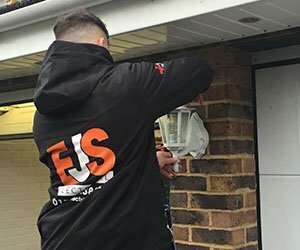 EJS Electrical are a professional and highly regarded Swindon based Electrical Contractor, specialising in all aspects of electrical work. We offer a comprehensive range of services for both domestic and commercial clients that includes both Letting Agents and Swindon Borough Council. Please don’t hesitate to contact us as we are always happy to offer help and advice in relation to any work you are considering. Whether you need an electrician now or later, it’s a good idea to familiarise yourself with the basic set-up of your electrics at home. So let’s try and do that here. From the street, a thick electricity cable enters your property through a fusebox, then through your electricity meter (where you can read the figure your provider will need to calculate your bill). From the meter, a cable will feed into what is known as the ‘consumer unit’, a wall-mounted box (in a plastic casing) hosting on-off switches for all the electrical circuits you have in your property. The switches are called ‘fuses’ or ‘circuit breakers’. The consumer unit comprises a switch on the far right of the console which turns on and off the entire electricity supply to the home issuing from the mains. This switch is called the Residual Current Device (RCD) protector. If there’s a fault in your electrical system, the switch will trip to the off position causing all the electricity in your home to be switched off. The RCD controls the current to each individual electrical circuit whether it be to your lights, your power sockets, your cooker, your freezer, boiler, immersion heater etc. The circuit breaker switches for each of these are ordered in a row left of the RCD Protector. Each circuit breaker is calibrated by the amount of current (amps) that flow through it – higher for appliances that need a higher current. It’s a good idea to label each individual circuit breaker i.e. the circuit for the lights upstairs, the lights downstairs, immersion heater, cooker, freezer etc. The newer type of consumer unit will have a mains switch and two RCDs. One for one group of circuits, say supplying upstairs, another group the downstairs so you won’t lose power to the whole property in one go. A ‘ring circuit’ is formed by a cable that connects a circuit breaker on the consumer unit to a circuit of various sockets around the building, before returning to the unit. These are sometimes preferred to a ‘radial circuit’, which is a cable supplying a linear arrangement of sockets (i.e. don’t return to the consumer unit). Appliances that plug into the sockets then have different amp fuses, higher for those requiring a more powerful current, which will isolate the appliance should they experience a surge of electricity. Electricity is of course very dangerous, so if you have any problems around the home, do contact a qualified tradesperson. If you’re local, looking for professional, reliable Swindon electricians, we’re here ready to take your call. You will want to rest assured that the electrics in your commercial premise – your office, school, restaurant, hotel – are working safely. 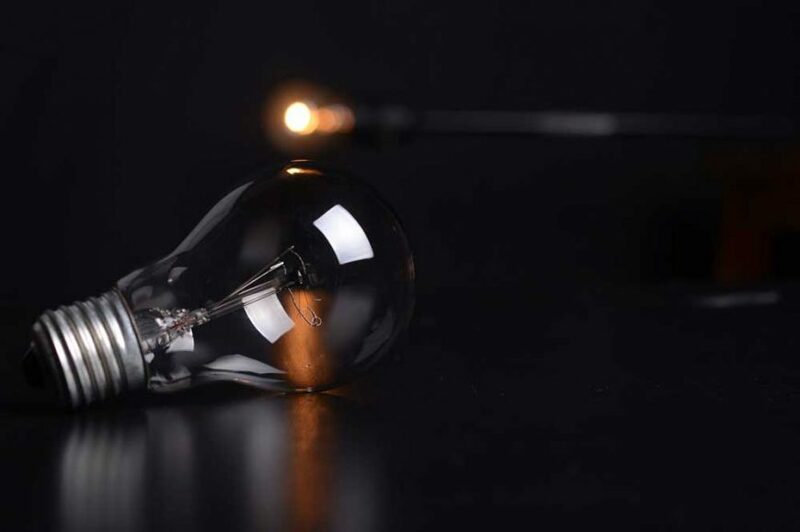 To have peace of mind knowing the inconvenience and disruption to your business from electrical breakdowns and repairs can be limited and that you’re not losing money through an outdated and inefficient electrical system. If you’re local, you might like to know about the range of services that we as Swindon electricians provide. Did you know that 70-80% of businesses never reopen after a major disaster such as a fire? We can install fire alarms – mandatory for any business – compliant with fire regulations. 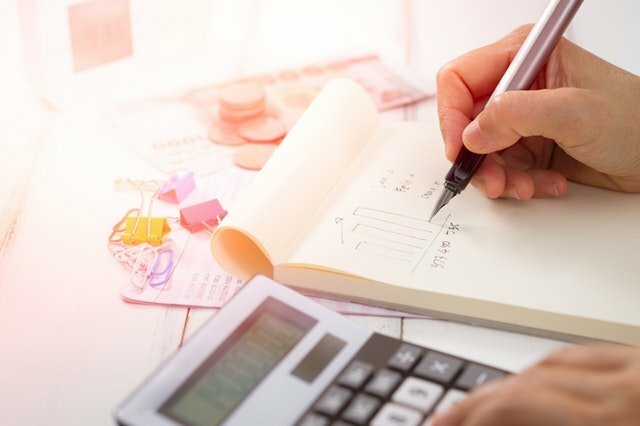 Non-compliance of Fire regulations can incur hefty fines for businesses, so it’s important that you have this in place. We can offer you a consultation on fire protection at the design stage or advise on effective ways to upgrade your existing system. EJS can install emergency lighting. The system will when correctly designed, installed and maintained, reduce the possibility of an accident or loss of life in the event of an electrical power loss. Again, this is a safety system required by law. We of course do the basics – providing maintenance. Wiring needs to be checked and if necessary a partial or full rewiring implemented. Then there’s the Electrical Reports. We will check cables for wear and tear, hidden inside walls or in consumer units tucked away in cupboards. 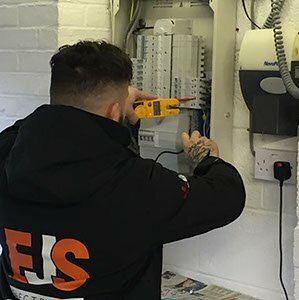 Our electricians will test all electrical items you have – including kettles, computers – plugging them into specialist PAT testing equipment. This records the status of those items, whether safe or faulty. If the former, the item is tagged with a green label, signed as ‘Passed’ and with the date of the check. These are important records for any insurance claims or Health and Safety compliance issues. If a defect is detected, electrical equipment can be replaced before it becomes a major problem and save you money down the line. An electrical mishap could well disrupt operations while you’re waiting to get it fixed. Old or faulty wiring is potentially hazardous, one of the main causes of fire in the workplace. 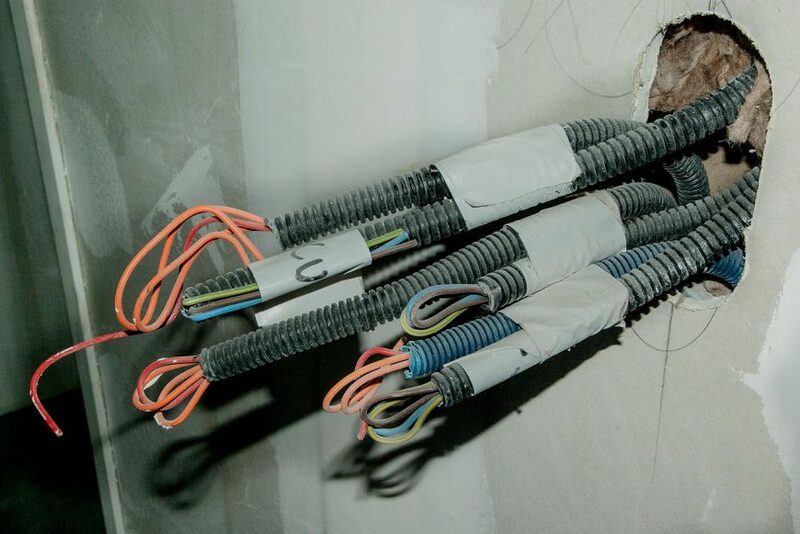 We will compile a full report of cables, switches and sockets on a regular basis. The Report will save you a lot of money and perhaps even lives. 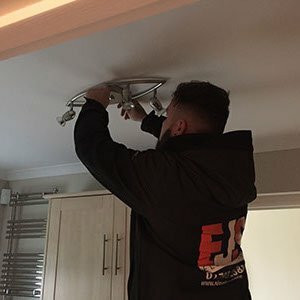 We can offer you everything from simple checks to installing a fully rigged-up computer room and guarantee that we will be there for you in case of an emergency.